The Auditory Evoked Potential (AEP) has a long history in human neurofysiology. With high intensities a signal can sometimes be seen in temporal leads in the EEG. It is questionable however, if the response is generated by the brain. More probable it is the myogenic manifestation of a reflex which is elicited with high intensity sounds. One of the first reports in literature is from Davis (1939) who investigated the effect of acoustic stimuli on the EEG. Althouqh some effect was discernable, its main effect was desynchronisation of the traces without specific activity attributable to the sound stimuli. It was not until the advent of averaging techniques that a more general interest in the AEP arose. Its first use was in the field of audiology with great expectations for objective audiometry. 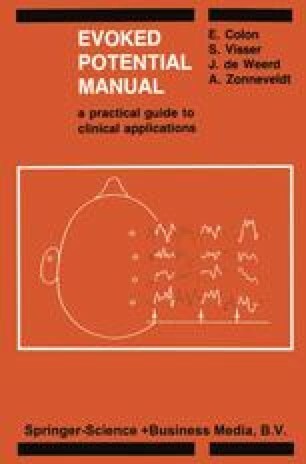 These were soon tempered by the realisation that the technique to acquire reliable results in Evoked Response Audiometry (ERA) was very difficult and also sufficient knowledge was lacking for interpretation of the obtained signals.